One of the best places to view Northern Elephant Seals is at one of the rookeries along the coast where they congregate to give birth, feed their young, and mate. Seeing the rookeries, you will be amazed at just how crowded the beaches get with seals that are looking to give birth, feed their newborn pups, and mate before returning to the ocean. 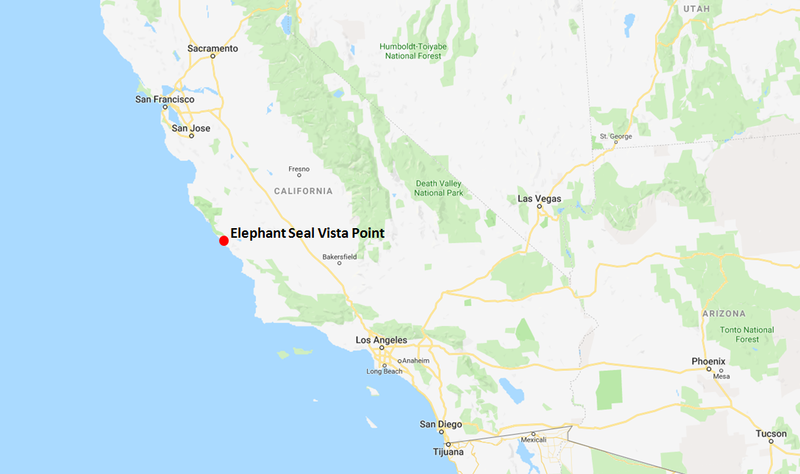 In this guide, I am going to highlight the Elephant Seal Vista Point, which is located just South of Piedras Blancas in Southern California. I will discuss what Vista Point is, the best way to get there, and what you can expect to see when you visit. I will also mention some of the other Northern Elephant Seal rookeries that can be found in Calfornia. Elephant Seal Vista Point is a highway pull-out viewing spot that is located roughly 15 miles South of Point Piedras Blancas in Southern California. Here, you can witness one of the largest congregations of Northern Elephant Seals as they gather on the roughly 6 miles of beach in the area to give birth, feed their young, mate, and get some rest out of the ocean. During the birthing and mating season, the beaches can become congested with elephant seals of all ages and sizes looking for open space on the crowded beaches. You will often see the large male elephant seals fighting for the prime real estate on the beach for mating and the mother elephant seals with their newborn pups by their sides feeding. When you see the Northern Elephant Seals, you will be absolutely blown away by how big they are. I didn’t realize exactly how big these animals got until I saw them in person. To give you an idea of how big they can get, I included a graphic above that shows you how big they can get in relation to the average adult human being. Elephant Seal Vista Point is located near San Simeon, California, which is roughly 4 hours North of Los Angeles and 2.5 hours North of Santa Barbara. If you are coming from Los Angeles, you will want to take Highway 5 North to Highway 101 to Santa Barbara. From Santa Barbara, you will continue on Highway 101 North until you get to Highway 46 West and then Highway 1 North. 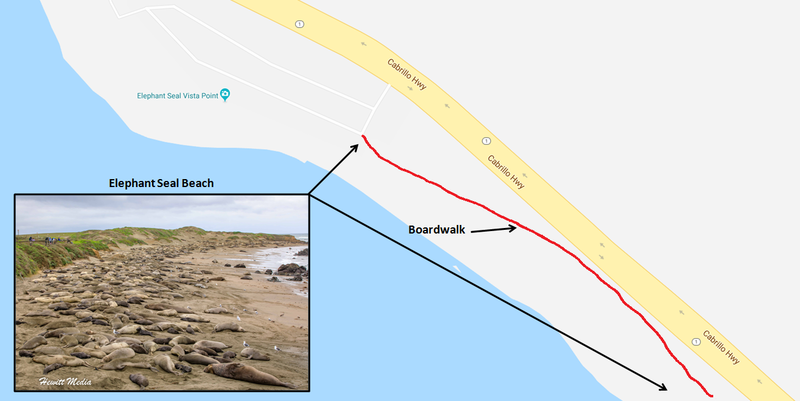 The Elephant Seal Vista Point will be located on the beach side of the highway. 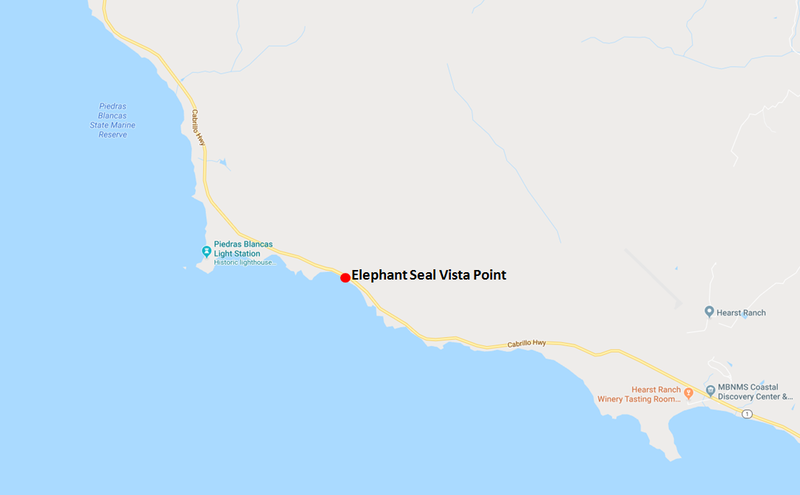 If you are looking for a rest stop near the Elephant Seal Vista Point, or just need someplace to fill up on gas or stop for lunch, the town of San Simeon is located off Highway 1 North about 5 miles (or an 8-minute drive) South of the vista. When you get to the Elephant Seal Vista Point, there will be a pull-out on the side of the road with a parking lot. Parking is free, but the lot tends to fill up rather quickly during the elephant seal birthing and mating season. If you are planning on visiting during this time, I would recommend getting to the vista early in the morning. Once you have parked your car, you will have no problem spotting the elephant seals on the beach. Keep in mind, there are roughly 6 miles of beach at the location, so the seals may or may not be near the parking lot. However, most of the time they can be found on the beach directly adjacent to the parking lot. There is a long boardwalk that you can use to get a bird’s eye view of the beach and take pictures of the elephant seals. I have included a map below to illustrate exactly how the pull-out, parking lot, and boardwalk are situated. You will typically see some sort of elephant seal activity at the viewing areas year-round, but some months of the year are better for viewing the seals than others. For a complete overview of elephant seal activity throughout the year, please refer to the calendar that I have included below. In my opinion, the best time of year to view the elephant seals at Point Piedras Blancas is between December and February, when the elephant seals are giving birth and mating. During this time of year, you will see the largest concentrations of seals on the beaches and you will have the added advantage of getting to see the baby seals. I should warn you that nature can be cruel, and this includes what you might see on the beaches at Point Piedras Blancas. In their effort to mate, it is not uncommon for adult male elephant seals to accidentally crush and kill baby seals and it is not uncommon to see many dead baby seals on the beaches. If you don’t want to see these tragedies, I would suggest you stay away from the areas where male seals are fighting. Viewing the elephant seals at Point Piedras Blancas can be a magical experience. You will not believe how big and strong these animals are until you see them in person. Some of the larger seals can be as big as a small car. To the animal’s safety and your own, I have included some viewing recommendations for you to review below. Always stay in the designated viewing areas. Do not attempt to walk on the beach and interact with the elephant seals. This is a great recipe for getting seriously injured. If you see an elephant seal leave the beach, and they sometimes do, do not attempt to approach the seal. Again, this is a great way to get hurt. Do not bring a drone with you. They are strictly prohibited in the area. Do bring a camera as you will want to get some great shots of the seals. Do not attempt to feed the seals, birds, squirrels, or other wildlife. You are not helping, but hurting the animals by getting them habituated to humans. Seeing the Northern Elephant Seals at any of the rookeries along the California coast is a truly memorable experience. No matter when you visit, there should be some sort of seal activity on the beaches. However, during certain months of the year, viewing is much better than others. To give you an idea of what type of seal activity you can expect at the rookeries throughout the year, I have included a calendar below for you to review. January Young, female elephant seals begin to arrive (peak last 2 weeks). February The peak of young elephant seal births. Females leave after. March The last adult elephant seals leave the rookery. April Young, female elephant seals return to birthplace to molt. May The peak of the female molting season. June Juvenile males return to birthplace to molt. July The peak of the male molting season. August By end of August, most adult elephant seals have left. September Very young male and female elephant seals return to rest. October Young elephant seals continue to use the beaches to rest. November Juvenile elephant seals leave rookery and large males begin arriving. December Large adults continue to arrive and females begin giving birth. If you aren’t near the San Simeon area, that doesn’t mean you can’t see the Northern Elephant Seals. There are a number of rookeries up and down the coast of California, though many of the rookeries are on islands. 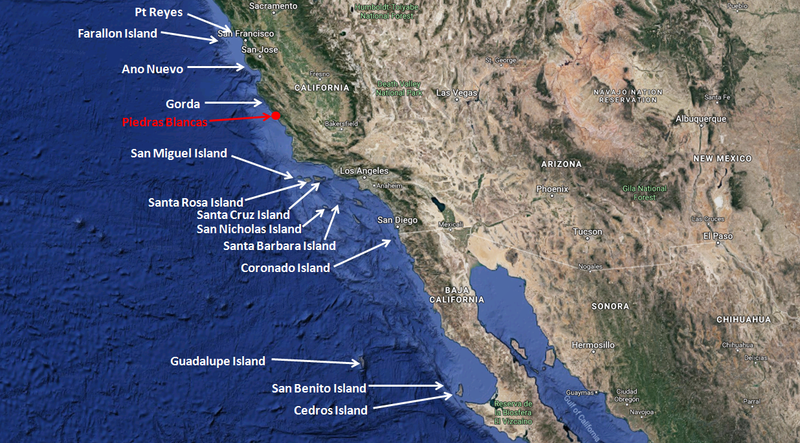 I have included a map below that outlines where the Northern Elephant Seal rookeries in California are located. To give you a sense of what it is like to visit Point Piedras Blancas, I have included a short video below of my visit. It was absolutely surreal to see so many of these large Nothern Elephant Seals on one beach. Seeing the Northern Elephant Seals at Point Piedras Blancas was a truly amazing experience. Below is a gallery of just some of the images that I was able to take during my visit to Point Piedras Blancas. What a great post. I’m shocked – SHOCKED – at how big they are relative to a human. And that video was quite humorous. I saw seals – or was it sea lions? – in northern California once. They were definitely not that big. Must have been a different species. Enjoyable read, as always. Yeah, it really surprised me too. I am guessing you saw harbor seals or California Sea Lions, which are all over the coast. The Elephant Seals are massive and a sight to behold. Thanks for reading and the kind words as always!